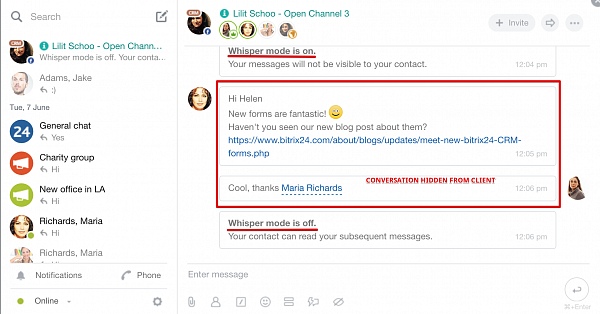 Open Channels is a new tool for your Bitrix24 account offering integration with popular social networks and other messengers. Open Channels consolidate various means of digital communications with your clients in Bitrix24. A fast and easy way to communicate with your clients in real-time. 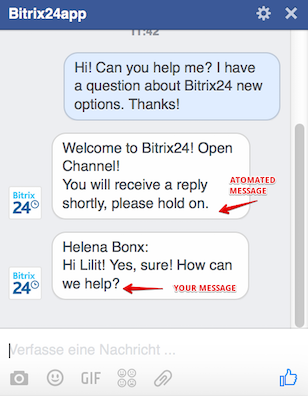 Simple as that - you will get all clients messages in your Bitrix24 chat. Conversely, your clients will receive your response via their message source – Facebook or Telegram (Skype, Web chat and Viber coming soon). Just select a group of employees responsible for social media queries and new messages will be automatically dispatched between them with the help of Bitrix24 Open Channels. 1. Create a new open channel. Option can be found under Company section of your Bitrix24 and is available for account administrators only. 2. Connect communication channels. At this moment you can connect Facebook public page or Telegram bot. (Skype, Web chat and Viber coming soon). 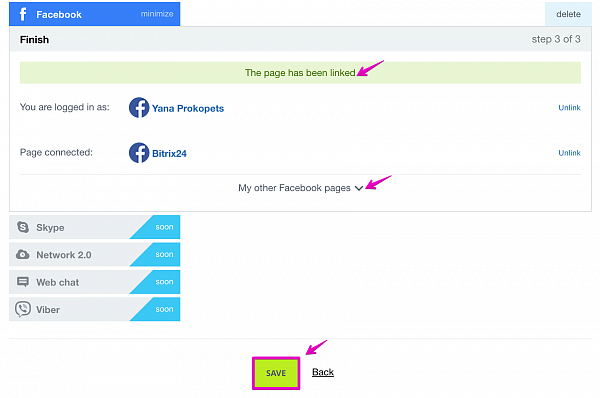 Important: You need to create your company Facebook page first or use an existing one. You also need to be an administrator for this page. 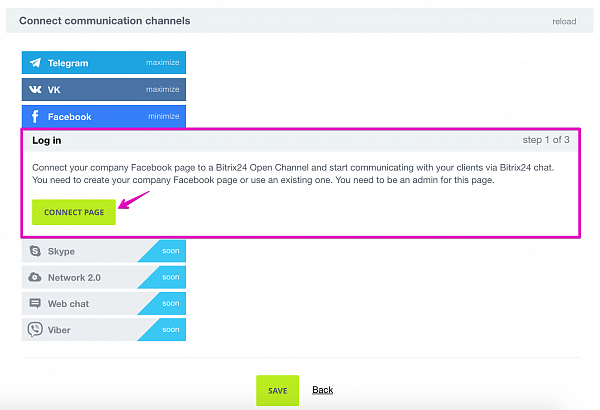 Follow Facebook authorization requests and allow Bitrix24 to access your page and send messages from this page. 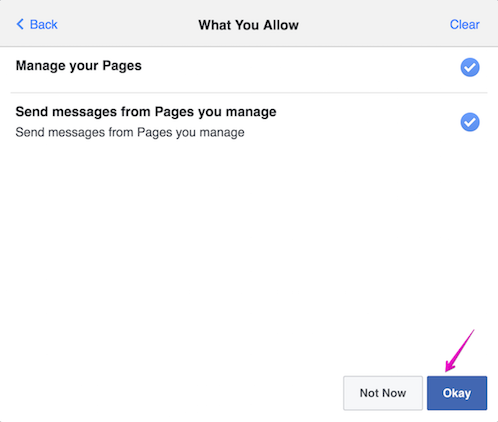 If you manage several public pages on Facebook, you can select which one you would like to connect. After you get the notification that your Facebook page has been linked, the process is finished – you can save Open Channel settings. Connected open channels can be found under Company – Open Channels. Here you can always edit the open channel settings. 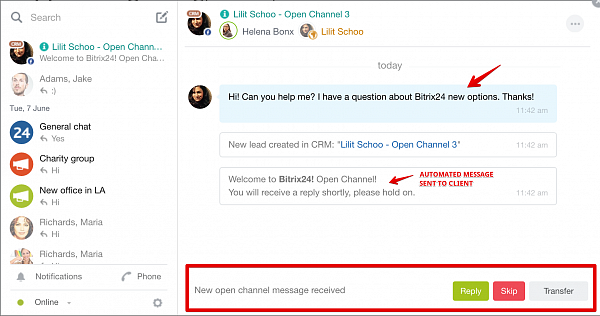 This message lands in your Bitrix24 chat and in case this is a new client – a new lead is created in your Bitrix24 CRM automatically. 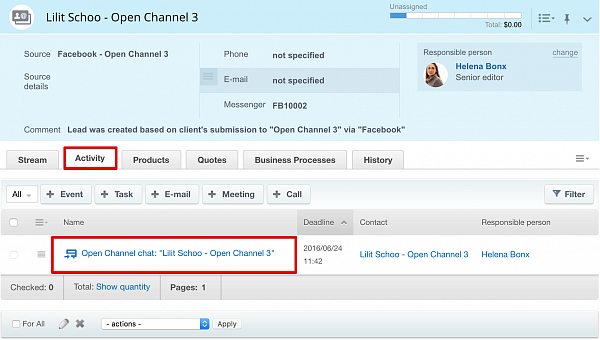 Here is how a message from the connected communication channels will look like in your Bitrix24: client name is marked with a different color so that you won’t confuse it with an employee or extranet users. There will also be an icon of the connected communication channel (Facebook in our case). An automated reply is sent to the client immediately (can be configured in open channel’s setting). - Reply: message will stay assigned to you. - Skip: message will be transferred to another user in respect to the configured users queue. - Transfer: you select the user whom the message will be transferred to. (Important – the transfer option is available for those users who have access for business tools). The client won’t see a difference between an automated message and your actual reply. Quit whisper mode to continue communication with the client. Additionally, you can pin the conversation – it prevents the dialog from auto-closuring in case your client is not replying (note: pin conversation time is limited). All chat history is saved. Open automatically created lead at any time and find chat history there. 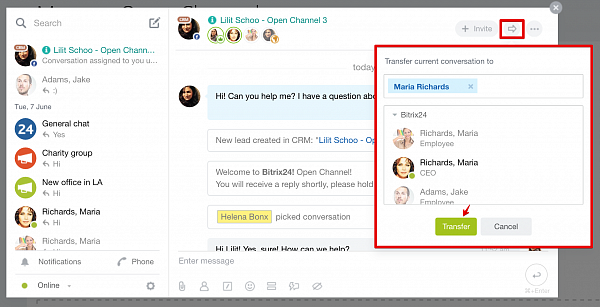 If one of your existing clients has reached you via Bitrix24 open channels – chat history will be attached to the corresponding CRM records in your Bitrix24 CRM. When you finish the conversation, there is also an option to send an automated message to the client (this can be configured in Open Channels Settings). 1. Open channel name - is set automatically and can be changed, but your clients’ won’t see it anyway. 2. Communication channels – you can connect several communication channels (e.g. Facebook, Telegram) to your Bitrix24. Connected communication channels are highlighted. - If the client has been identified in your Bitrix24 CRM – the message will be transferred to the user who is responsible for this client in your CRM (even if this user is not listed in the queue). a) the system will create a new lead automatically. Important: a new lead will be created only if client’s contact information is available. b) you will have to create lead manually in the chat window (in this case lead’s name & chat history will be automatically transferred to a new lead CRM form). New Lead Source: by default, leads received from open channels will be marked with “open channel source”. Sources can be configured in CRM > Setting> Start point > Statuses > Sources. Queue: select responsible persons to respond to submissions in the Open Channel. You can also specify submission distribution mode (evenly or exactly as enqueued) and responsible person response timeout for auto requeuing (from 1 to 30 minutes). Unanswered submission processing: if none of the employees could answer the submission, you can set the system to reply with an automated text message, submit a CRM form (coming soon), enqueue it back or do nothing. 4. Customization of working time preferences: set the timing for open channels messages processing by your Bitrix24 users and what will happen with the off-hours messages. For example: clients will receive an automated text reply, a new CRM form will be submitted or the system will do nothing waiting for you. All history is saved – chat messages will be attached to the corresponding CRM record. Open Channels statistics is at your disposal as well. 5. Configure actions: prepare a greeting message that will be sent immediately after the client has submitted initial message. You can also prepare an automated text reply which will be sent to a client as a conversation closing action. Conversation timeout & auto closing can also be configured there. Impress your clients with your proficiency and personal approach. Become leading customer-oriented company with Bitrix24 Open Channels!